As you can see I have bought two items I had on my whishlist!! I just couldn’t help myself. The stripe shirt is from H&M, it cost my mom (She is an amazing mom!) 15€ and it’s amazing. The sleeves and the back of the shirt are made of a different material from the front and its style is a bit baggy and sophisticated. 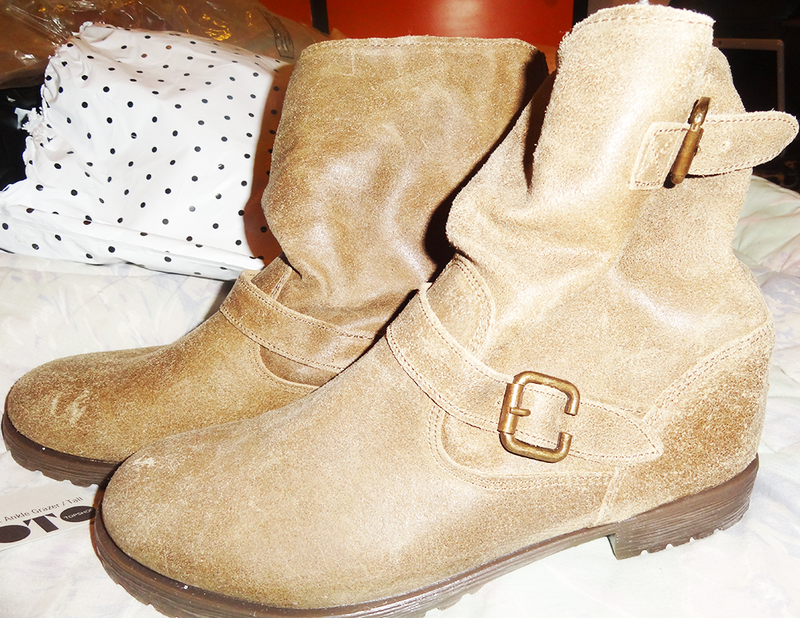 These boots are from Topshop. Since I’m a size 9 it’s really complicated for me to find shoes that fit me as it is once I saw those I thought they would be amazing for myself – and they are. They’re really comfy and warm, made of faux fur and are 50% of leather! What can I say about those? They are as amazing as I thought they would be; really soft, comfortable and long. They came from the Tall Section on Topshop!! The Aztect print is, as Alicia Keys would say, on fire! It’s everywhere and I’ve already surrendered myself to its power. This Leopard Beret came for free, it was a topshop gift for some unknown reason. To be quite honest I’m not in love with it, I actually don’t like it very much. It’s not my style I guess, but it’s nice nevertheless – it’s really soft and seems quite nice, if only I liked the print. So this is it. A bit expensive shopping if I’m honest – which I don’t want to be – but worth it. They look good on my wardrobe and even better on myself! and after my first semester in university I deserved it! This entry was posted in Clothes, Fashion, Shopping and tagged aztec, aztec print, black and white, boots, clothes, fashion, h&m, jeans, leather boots, leopard print, shirt, shopping, stripes, topshop, whishlist. Bookmark the permalink. Vi hoje umas leggins super parecidas com esses jeans no fórum Coimbra. Não sei se na Zara ou na Pull. Gosto tanto!! eu disse-te que ia haver bués por cá! Eu já vi umas parecidas na Shana (eu sei, eu sei, parece loja de cigano LOL).